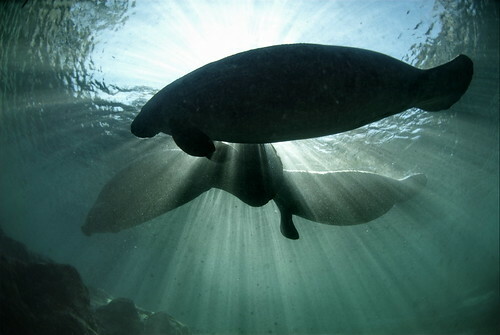 These manatees are crossing over the King Spring toward the manatee sanctuary’s shallow waters while the sun rays penetrate the spring waters. The Crystal River National Wildlife Refuge, was established in 1983 specifically for the protection of the endangered West Indian Manatee. This unique refuge preserves the last unspoiled and undeveloped habitat in Kings Bay, which forms the headwaters of the Crystal River. The refuge preserves the warm water spring havens, which provide critical habitat for the manatee populations that migrate here each winter.